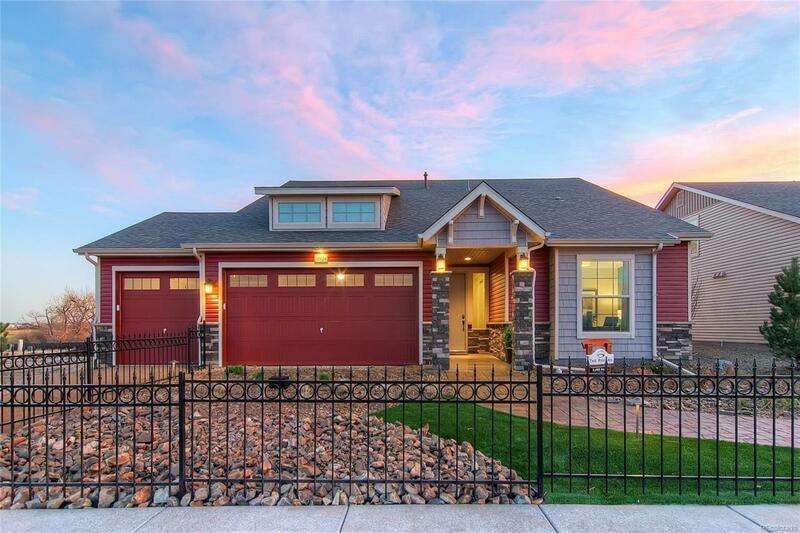 Model Home For sale! Experience a ranch style plan at its finest in this desirable Active Adult community at Fairway Villas! The beautiful and open kitchen, dining and great room provide all of the space you need for entertaining. The culinary kitchen hosts stainless steel appliances with gas range with Sepja Sonata Quartz counters and large eat in island along with Somerton Hill Maple cabinetry! Enjoy the luxury of having everything you need on the main floor with upgrades throughout including; gorgeous Nottoway Hickory 5" plank wood flooring throughout the main areas, while the master suite hosts a tiled spa style walk-in shower, double vanity and DeNova Khaki granite counters. The secondary bedroom and bathroom is perfect for your familys needs while the main floor laundry adds the touch of convenience you desire! Wait there's more! Walk upstairs to find the spacious Guest Retreat with bedroom, bathroom and loft! Call today and come see why we are the Builder of Choice in Colorado!